The Los Angeles Karting Championship hosts a sprint kart race series on Sunday mornings at The Auto Club Speedway. We have over 240 members of all ages. Anyone can come on race day and race in our series. You only need to become a member to accumulate points for the season. Spectators are welcome to come and watch a race. For insurance purposes, spectators are required to purchase a pit pass. The pass will allow you to walk around the pits and see the karts up close. Since 1985, the Los Angeles Karting Championship series has provided a family-friendly, sprint kart racing environment for all ages in the Southern California region. Our mission is to provide the most competitive, largest sprint kart classes in the region at the lowest prices in the industry. We are extremely proud of averaging of 2,400 competitive entries per year. Our series operates from the CalSpeed Kart Track located at Auto Club Speedway, in Fontana, CA. How fast do karts go? It varies depending on the class, but most of the karts are going about 65 mph at the end of the straight. What kind of engine do they use? Most classes at LAKC use a 100cc or 125cc, single-cylinder, two-stroke, air and water cooled engines developed especially for kart racing. The Kid Karts use a Honda 50cc four stroke and Cadets use the Comer 80cc two stroke engines. Shifter karts use a 125cc engine and a six-speed gearbox. What kind of clutch do they use? The 100cc and 125cc classes usually use a multi-disk centrifigal clutch and a single gear. How much does getting into karting cost? A brand new, race-ready, 100c or 125cc kart will cost between $4000 and $7000. A good used kart will usually run between $2500 and $3500 and you may be able to pick up some extra parts as well. Safety equipment will run between about $450 and $800 depending on how extravagant you get. Special tools, a starter, and a kart stand will be around $400. A set of tires cost about $220 and will last you between two and five race days. Race entrance fees $85.00 and membership $75.00. $15.00 for crew and spectators insurance wristbands. Can I build my own kart? Yes, but it’s not worth it. Race karts have become well engineered equipment. Competition between manufacturers is fierce, and if you wanted to build a competitive chassis, you would have to spend far more money in research than it would cost you to buy one off the shelf. But don’t worry, in karting there are enough adjustments you can make and little gadgets you can build to keep the engineer in you content. Is kart racing safe? What kind of safety equipment is required? Every form of driving has some risks. 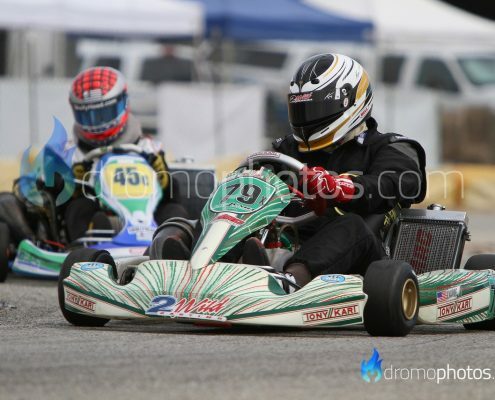 All kart racers are required to wear a full-faced Snell rated helmet, skid-resistant race suit or jacket, racing gloves, padded neck brace, and high-top race shoes or tennis shoes. Many racers also wear a rib-protector, as broken ribs are one of the most common racing injuries. An EMT or paramedic is required to be present at all races. What age do I have to be? Is there a maximum age? You must be at least 5 years old to race with most kart clubs. There is no maximum age in kart racing. A number of competitive drivers are well into their 50s or 60s! First, visit us on race day. See the karts in action. Does it look like fun to you? Then, attend a kart school. You’ll get a chance to drive a kart and decide whether or not you really want to make an investment in the sport. A school is the most cost effective test drive. Next, come back and attend another kart race, perhaps even several. Ask questions and start looking more closely at the different classes. Introduce yourself to some of the karters. You may find it helpful to know a few by name on your first race day. Once you’ve narrowed down which class or classes you are interested in, it’s time to find your first kart. New or used? It’s up to you and your budget. Many racers start with used equipment while they learn about the engine, the kart, and driving. After that, practice, practice, practice. Become comfortable driving the kart fast. It’s best to get your seat time at an actual kart track. Large, empty parking lots are tempting, but the curbs, parking standards, and other immovable objects are dangerous. It may also be illegal in your area. When you feel comfortable in the kart and you’ve mastered basic kart maintenance, you should be ready to enter your first race! Yes. You do need to be licensed. You should develop basic kart control skills before attempting to race. There are several kart racing schools in Southern California. Where can I practice? Can I drive a kart even if I do not want to race? 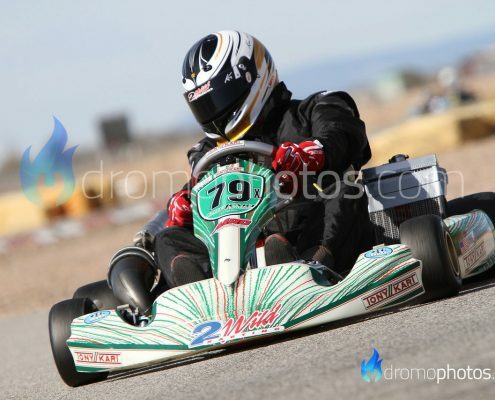 There a several kart tracks in Southern California which have open practice days. The Autoclub Speedway is available to us on race day, and we have an official practice sessions before we begin the races. You do not have to race (compete) to enjoy driving a kart. Many kart owners attend open practice at the various local tracks and never enter a race. Where can I buy a kart? There are several kart shops in the Los Angeles area. Check out our links page for a list of places you can check out.